Everyone breakfasted – Miss Jones’ hair salon is now closed for business! Phones/iPads that had been confiscated have been returned with a strong warning! OF reminded to ski in line today or else! Lots of sun cream needed today! It’s a dirty job but someone has got to do it! “Helmets, goggles, gloves” – here we go again! Last minute panic as MD could not find his gloves, but all sorted. Copthorne skiers are like a well oiled machine as they depart the hotel for the slopes lathered in sun cream, having been to the bank, and collected their lunch vouchers. 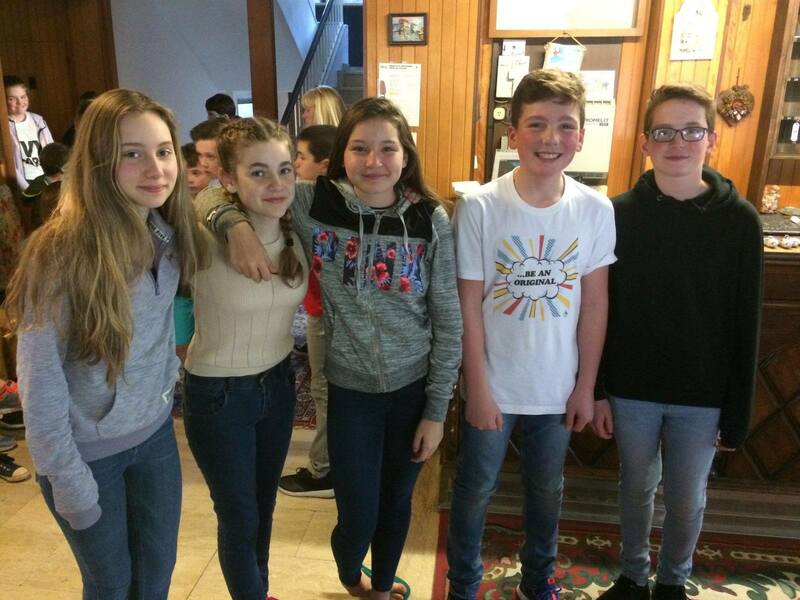 Group 2 skiers will be using poles today so it is likely to be messy!!! HB has finally realised that he has lost his wallet so Franz has put him out of his misery! Listening to Chris Rea on the radio, what could be better – even the voice over queen is quiet! 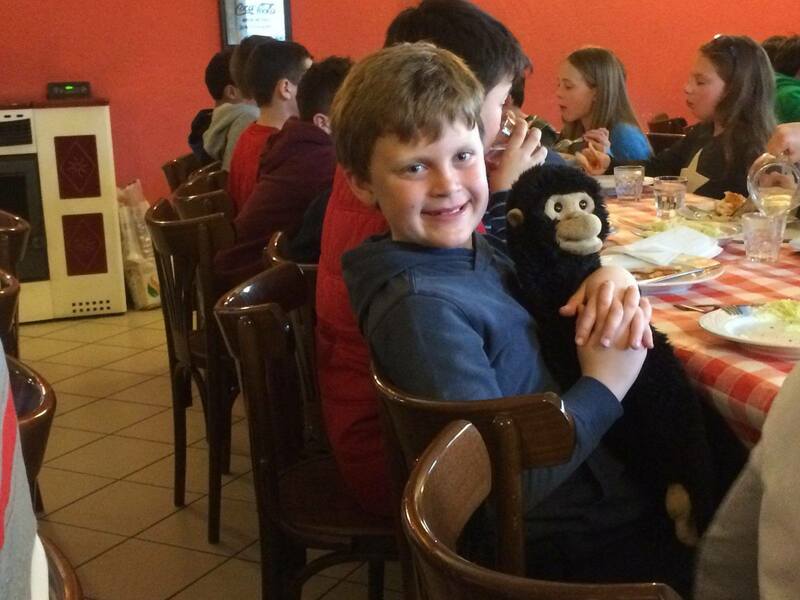 4TC’s class mascot, Jeffery, is spending the week with Dylan. Jeffery is making a trip up the mountain today! Sadly the wheels have fallen off the efficient Copthorne machine. OMG, LG left her skis on the gondola – she got off but did not get her skis that have now gone back down the mountain! OMG, GG cannot find her gloves! Fortunately the Interski machine is very efficient and spare skis and gloves appeared by magic. Top marks for Interski – no marks for GG and LG. OMG, LG dropped her goggles off the chair lift; she is not having a good day!!!!! Franz and LC were both victims of the snow monster who made us fall over. Franz was on a very steep and icy red practising his carving turns – LC was on a blue!! 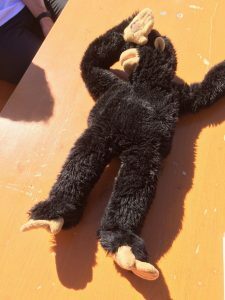 Franz was carrying Jeffrey with his head out of his backpack, who took the brunt of the fall. Franz is fine – Jeffery has concussion!! 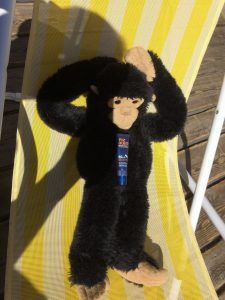 Jeffery feeling a little better – having a sunbathe! Even Jeffery is sun safe! Just discovered that Jeffery likes a beer!! Yes! Jeffery still sunbathing. MA thinks he looks a bit like a male member of the Copthorne staff? Does anyone agree??? Back at the hotel all showered and smelling sweetly! Tales from the slopes beginning to emerge with spectacular falls, bent poles, wipeouts, etc. Franz is disappointed that one Year 6 girl bought bubble gum, knowing full well that it is banned on this trip! FT was fast asleep on the 20 minute trip back to the hotel, but he is already looking forward to to pizza! 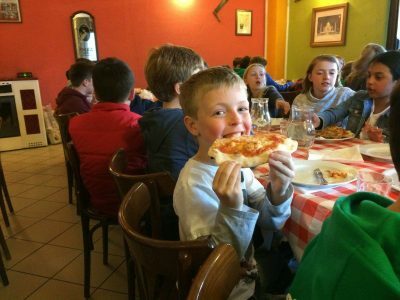 Jeffery has sobered up sufficiently to join us at the pizza restaurant – although the two bangs on his head and possible concussion mean he won’t be playing rugby with DR for the rest of the holidays! Some nicely sunburnt faces and the forecast is for it to be even hotter tomorrow! Steady stream of parents calling the hotel. Franz answered one call but it was an Italian wanting to book a room for next week!! I was like Manuel from Fawlty Towers until the owners came to rescue me! I hope I didn’t lose them customers!! The staff have started calling WM Roudolf as he had such a red nose! OF stop it! Stop what! Whatever you are doing!!! Time to go I think! 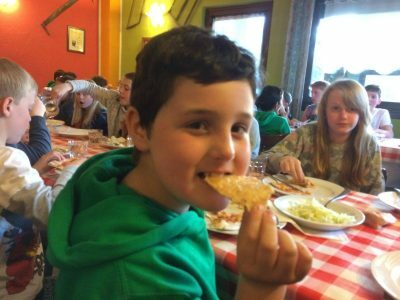 42 children, tired and emotional, high on fizzy drinks, as much pizza as they can eat, followed by a delicious chocolate Tort! Photo captions! Year 8’s photo time; FT in pizza eating mode! 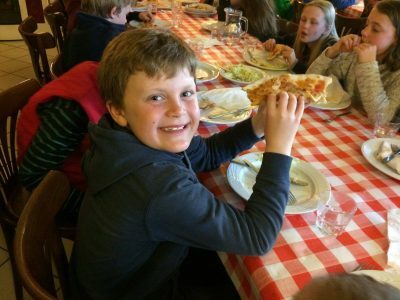 ; A fussy eater, eating; Jeffery enjoying a pizza with DR; DR enjoying pizza without Jeffery! Thank you for finding MD’s gloves! Purely medicinal I’m sure…. Please don’t go leading poor Jeffery too far astray though Franz as we will only have two weeks to get him through Rehab and Classroom friendly again upon his return! Jeffery is stealing the show! Too funny. Hope my little boy is behaving. Surprised I have not heard comments about his non-stop chatting!! Enjoy! !